After Buddy DeSylva picked up the Livingston & Evans song “A Square In The Social Circle” for Betty Hutton to perform in The Stork Club, Louis Lipstone invited Jay & Ray to join the music department at Paramount Pictures. Being new staff songwriters in 1945 L&E were given the job of writing music and songs for the short subject films produced by Paramount to be shown between their feature films at theatres. This lasted for approximately one year. In 1946 as fate would have it once again lady luck would smile down on Jay & Ray. It seems none of the established songwriters that were under contract to Paramount, including Victor Young, wanted to try their hand at writing a theme song for a new film with a title that was based on a phrase that at the time was unknown. It was customary for most new films to have a theme song written using the title of the film so the studios could use the recording to help promote the new films via radio. In this case the title of the film was TO EACH HIS OWN. This title was taken from an obscure poem written by John Donne. Paramount hated the title, however, the producer, Charles Brackett, insisted on it. Livingston & Evans jumped at the assignment to write the best song they could with this title. Years later Jay said “at that point of our career we would have written Come To Jesus in e flat.” L&E simply wanted to show what they could do. Wanting to prove their worth, L&E put much time and effort into writing this song to make sure it was the best it could be. The result of their effort paid off. 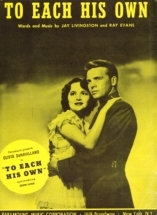 “To Each His Own” ended up becoming the most successful song of 1946. At one point for three solid weeks, five of the Top Ten Records according to Billboard Magazine were “To Each His Own”, as recorded by; Eddy Howard, Tony Martin, Freddy Martin, The Ink Spots, and The Modernaires. “To Each His Own” not only became a huge hit recording, it also became one of the most successful sheet music sellers in history. Need we say, it has also since become part of the English vernacular. * “To Each His Own” is published by Famous Music. * “Strange Little Girl” Jay Livingston Music, Inc. not only controls 50% of the Composition for the world, we also control 100% of the Master Recording.